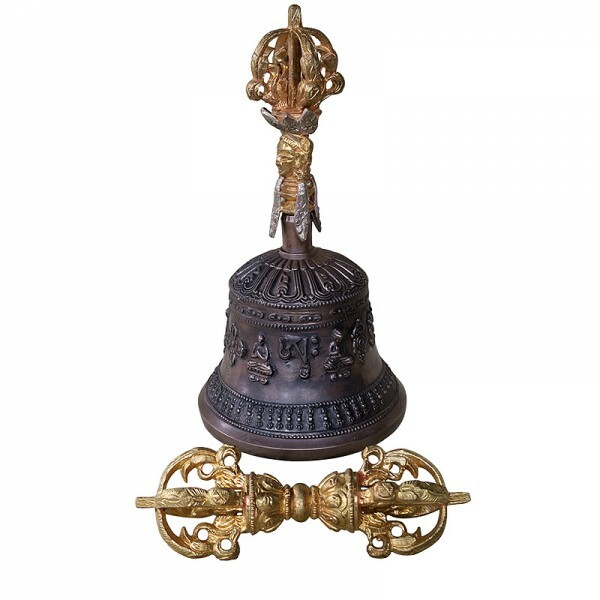 Superior quality Bell & Dorje set 7 inch special is made out of seven metal mixed material designed with beautiful mantra, Buddha and or other auspicious signs supplied with gold colour detachable crowned Buddha and Dorje handle. The beautiful gold colour Dorje is also supplied as a set like it is shown on the picture. The bell represents the female aspect which stands for wisdom and this is held in the left and Dorje held in the right. They are always used in combination during the religious ceremonies. Hence Bell and Dorje are inseparable ritual objects and two together lead to enlightenment. Due to the handmade nature of the product, it can be slight different than it is shown on the picture in each time when they are produced, hence, the final product may vary. The given weight of the bell and dorje is calculated for the shipping purpose so that the actual weight can be different than it is mentioned here.